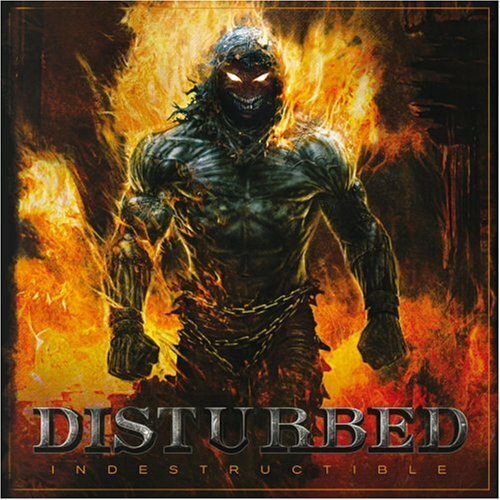 Indestructible is the fourth album by Disturbed and their second in the hard rock/traditional heavy metal style that was adopted on their last album, Ten Thousand Fists. Aside from a small step forward in musicianship not much has changed stylistically and Indestructible is a direction continuation of that sound. This time around there are less songs and a slightly shorter running time which both work in Disturbed’s favour because despite refining their knack for high calibre anthems even further, Indestructible is very much a by the numbers effort and the first few songs will let you know exactly what you’re in for so not much is going to catch you off guard. The title track gets the ball rolling and sets the tone perfectly with a mid-paced guitar riff that is preceded by air raid sirens. The lyrics have an inspirational angle that is used to address and motivate soldiers which contrasts with the contemplational lyrics of Overburdened, a song from Ten Thousand Fists, which deals with the morality of war and its consequences. Many of the other lyrics found on Indestructible deal with harsher subject matter such as suicide (Inside the Fire), mental illness (Perfect Insanity) and domestic abuse (Façade) but if your band operates under the moniker Disturbed you probably feel somewhat obligated to live up to your name. Unlike the infamous shock monologue heard on Down with the Sickness from their debut album, Façade is far more mature in dealing with the subject matter of domestic abuse, which describes the situation of a female victim with David Draiman questioning “for how long will you try?/how long until you walk away?/your facade can’t disguise/the fact that you’re in misery” before the situation is escalated to her retaliation with lines like “homicide flashes through her mind again/no more pain, take control/if he raises his hand again/she’ll find her freedom in killing him/the world will see that she’s had enough” which points to her taking her partners life and the situation subsequently unfolding through the media. Perfect Insanity and Divide were both originally written before the release of their debut, The Sickness, in 2000 but they didn’t make it onto the album and it’s not hard to see why since they didn’t adhere to the strict nu metal sound that Disturbed moved onto at that stage in their career. The groove metal foundation of these songs translates into their current hard rock/traditional heavy metal sound exceptionally well because they both offer a lot of aggression that is rounded off with their emphasis on melody to bring the best of both worlds together. Other moments on the album such as the bridge to Enough ramp up the aggression not only in terms of instruments but also in terms of David Draiman’s vocal delivery, which is done with a deeper snarling voice that is outright ferocious. His manic laughter on Inside the Fire is another highlight in its own right while the keyboards/programmed parts heard on some songs are tastefully integrated to enhance the atmosphere. To some listeners Indestructible could start to wear thin after a few listens because Disturbed haven’t really pushed their sound out of the box on this album but their ability to fuse hard driving guitar anthems with an unrivalled sense of melody will undoubtedly allow them to embed themselves in your ears after any amount of time spent listening to them.